Shopping for a BMW 7 series in the Burlington area is made easy at Budds’ BMW Oakville. It is our goal from the moment you step into our showroom to provide you with excellence in customer service. We are committed to working hard to meet and exceed the high standards that you deserve. At Budds’ BMW Oakville, we have been retailing luxury cars since 1973 and have always believed that we should treat people the way that we would like to be treated. 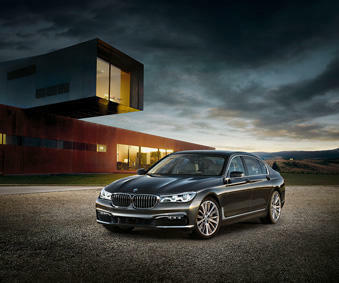 The BMW 7 Series is luxury reinvented. A combination of technical innovation and high quality of all details makes this a superior vehicle both inside and out. During the design process we developed the term “Technological Poetry”: “The feeling of a perfect interaction between progressive technology and its translation into design. The BMW 7 Series includes such innovative functionality as Gesture Control. With Gesture Control, selected functions can be operated by means of defined hand movements. Simple gestures such as swiping or pointing are identified in the recognition area above the centre console and trigger a function such as accepting or rejecting an incoming phone call. Another cool new piece of technology used by the BMW 7 Series is the BMW display key. The BMW display key shows information about the car’s status and allows some functions to be controlled by an integrated touch display. The time can be displayed, along with remaining fuel and current range in addition to current status of the central locking system, the windows and the glass roof. The auxiliary heating can also be operated by the BMW display key. At BMW Oakville, we put drivers first. Trust the experts at BMW Oakville to find you the vehicle of your dreams and provide you with unparalleled customer service.